(NaturalNews) If you suffer from a serious diabetic condition, and rely on a medical injection device for insulin, beware: Many such devices have been recalled throughout this past year for potentially fatal flaws, the latest being the GlucaGen HypoKit by Novo Nordisk Inc.
A September 8 recall warning issued by Novo Nordisk explains that six batches of the GlucaGen HypoKit (glucagon [rDNA origin] for injection) have a design flaw that causes the syringe to become detached from the device. The result is patients not getting the insulin they need, which could lead to serious complications, including death. 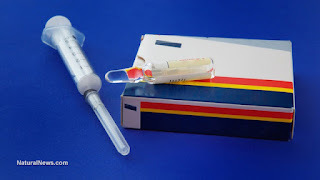 According to the company, only a very small percentage of its GlucaGen HypoKits – 0.006 percent, or about one in 17,000 – have this design flaw. But because there's no way of identifying which ones do and which ones don't, it would be like playing Russian roulette for patients to continue using them in their current state. Those in possession of an affected product are encouraged to call Novo Nordisk at 1-888-840-1137 for information about how to return it for a full refund. If you've experienced an adverse reaction in association with a GlucaGen HypoKit, you can contact Novo Nordisk's adverse event reporting line at 1-800-727-6500. "Novo Nordisk is working as quickly as possible and in collaboration with the U.S. Food and Drug Administration (FDA) to recall affected products from the marketplace, including those in the possession of patients," the company said in a statement. "To date, Novo Nordisk is not aware of any known adverse events resulting from the use of the recalled batches." Novo Nordisk isn't the only pharmaceutical company that's been selling faulty injection devices that put patients at risk of death. Sanofi earlier this year pulled from the market every lot of Auvi-Q, after it was discovered that the allergy devices were giving the wrong doses of ephedrine to patients, most of whom are young children. This recall included 492,000 two-packs of the devices. Mylan was also forced to recall 14 lots of its calcium chloride infusions last year over faulty syringes that weren't compatible with the device's needle-free adapters. Mylan, as you may recall, is the infamous manufacturer of the EpiPen that's been all over the news lately due to the company's jacking of its price roughly six-fold, from $100 for a two-pack to nearly $600. As we earlier reported, insulin injectors are inherently unsafe, accounting for widespread disease and death. A study published in the Journal of Clinical Endocrinology & Metabolism found that using one doubles a person's risk of death from all causes – not exactly the type of thing someone suffering from diabetes needs in his or her life. There are better ways to treat and even reverse diabetes, including sticking to a diet that avoids its triggers. Growing your own chemical-free food at home is one way to do this, as convenience foods are often loaded with sugar, genetically-modified organisms (GMOs), pesticides and various other metabolically-damaging ingredients and additives.